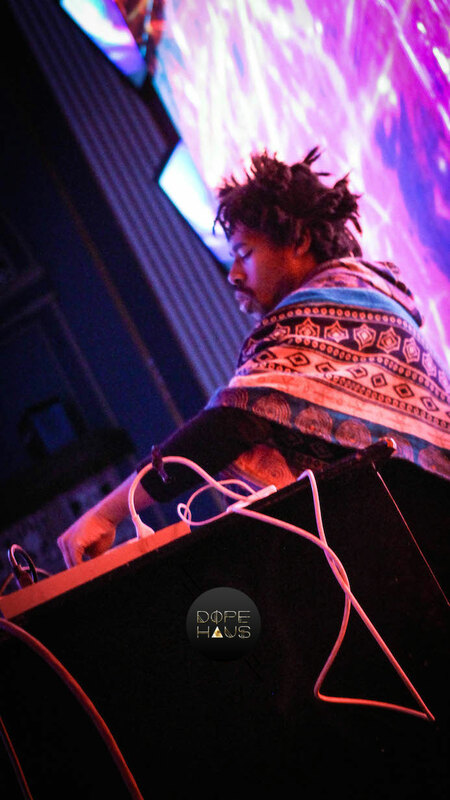 Los Angeles native Steve Ellison is two-thirds music maker and one-third alien as Flying Lotus. Ellison is so heavily involved in the sci-fi space and such an all-around occult master en générale, that if there was ever a candidate to represent Earth he’d be well equipped to translate on our behalf. After touring his 2014 Warp Records release You’re Dead! and directing the “grossest movie ever“, Flying Lotus landed in Calgary to headline and curate Sled Island Music & Arts Festival. DOPE HAUS press correspondents Carolyn Yates and Chanel Klein had a chance encounter with Fly Lo outside Calgary’s Broken City bar and music venue. Sled Island gifted Flying Lotus tremendous creative control in curating a part of the festival’s lineup. “I’ve never done anything like this before. It’s amazing. I had submit hundreds of artists originally,” Ellison laughs, “I had Bones Thugs and Harmony on the list too, but it didn’t happen though.” With Fly Lo’s blessing as curator, Sled Island popped off all weekend at local favourite inner-city clubs and neighbourhoods. The Los Angeles artist watched his top Sled Island selection Tierra Whack from the back of a packed audience at Broken City. After blowing Calgary’s minds with his bombastic headliner set, Flying Lotus brought Tierra Whack on the main stage for a encore performance to a packed crowd at Palace Theatre. 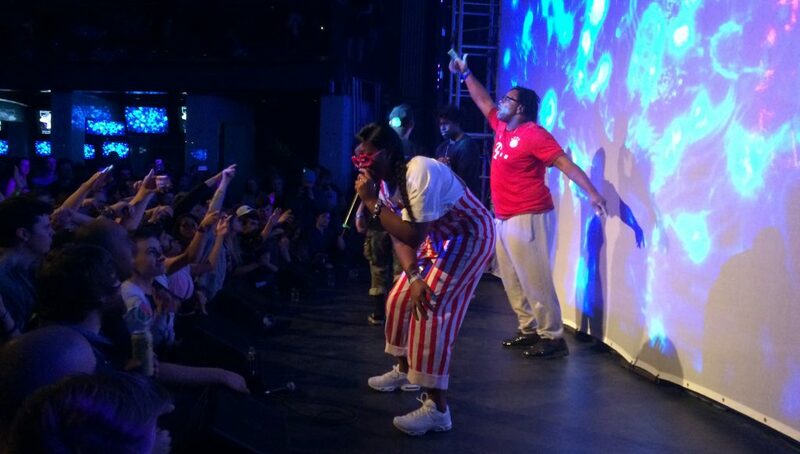 “I had a rare chance to put some folks on the line-up that ya’ll might not know,” Flying Lotus said before he invited Tierra and her crew on stage. Flying Lotus also selected Houston artist Seven Davis Jr for Sled Island’s lineup. Seven’s vocal reverberations and live techno drummer saturated souls and altered states well into closing time at The Hi-Fi Club. “[Flying Lotus] said he’s a fan of my sophomore album Live From The Other Side, so we performed most of the entire album specifically for him. The crowd was amazing and we hope to come play Canada often,” says Seven Davis Jr. In his most recent abstract expression, Fly Lo directed his debut feature film Kuso and cast his peer, and comedian, Hannibal Buress to play the role of a bong-smoking, furby-looking roommate in one of the vignettes. The film, which premiered at Sundance in January, was dubbed the ‘grossest movie ever’ by Variety magazine. What’s next for Fly Lo? One could assume based on our conversation outside Broken City that the extra-terrestrial is heading back to the mothership to work on a sci-fi project. “What do you think of when you imagine space? What do you imagine as an artist, if you were to make your space epic? What would it sound like to you?” says Fly Lo, “To a lot of people it sounds like synthesizers and stuff. To Kubrick, it sounded like classical music when he did Space Odyssey. It all depends on who’s saying what. I would love do to a jazz one, like a jazz space movie.” Not a strange goal considering his uncle was one of the jazz greats, John Coltrane. 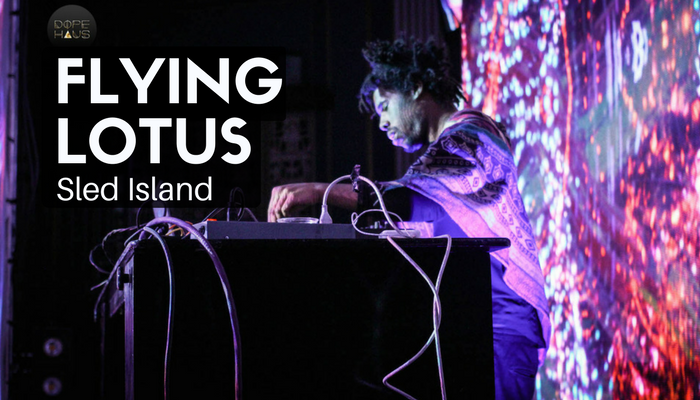 Flying Lotus’ headline performance at Sled Island was a spastic music lover’s heaven and a seeming culmination of his talent and an insight into the human experience. By the end of the festival, he was one of us. He was our underground mascot, a documented musical bigfoot sighting that validated the underground music scenes’ ongoing battle against the city’s administration to quell an alternative sound. He no doubt penetrated the mainstream music crowd in attendance and punctured their innocent ears. And for that, he was our hero, flying in with his poncho for a cape, as unassuming as Superman and as awe inspiring as a flying lotus.